Think you have the boldest pucker face? Fuze wants to see that during the FUZE Fusions Promotion 2017. 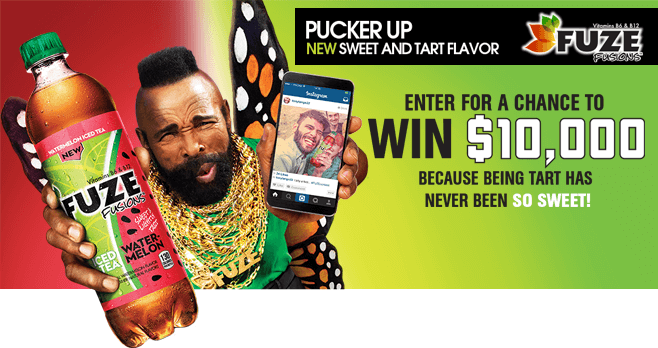 Snap a selfie with your favorite FUZE flavor and share it on Twitter or Instagram using #FUZEContest. You could win $10,000 to create the boldest adventure of a lifetime. Being tart has never been so sweet so enter by April 30, 2017 for your chance to win. Take a picture of yourself depicting your boldest pucker face. You can also include your favorite FUZE flavor in the photo or simply add it to the photo description. Then, post your selfie on your choice of Twitter or Instagram. Be sure to include the hashtag #FUZEContest to be eligible. Upon validation of your submission, you will automatically receive one entry into the Sweepstakes. You can increase your chances of winning the $10,000 grand prize by sharing a new selfie each day during the Promotion Period. Each Submission must be unique so get creative! The FUZE Fusions Promotion is open only to legal residents the 50 United States (or the District of Columbia) who are 18 years of age or older at the time of entry. Contestants can earn entries during the Promotion Period beginning at 12:00 a.m. ET on March 1, 2017 and 11:59 p.m. ET on April 30, 2017. Regardless of method of entry, there is a limit of one Sweepstakes entry per entrant per day. The Grand Prize winner will be selected in a random drawing from all eligible entries received during the Promotion Period, on or about May 2, 2017. The name of the grand prize winner is available online at http://bit.ly/2gJU53u. This Contest is sponsored by Coca-Cola Company, One Coca-Cola Plaza, Atlanta, GA 30313.